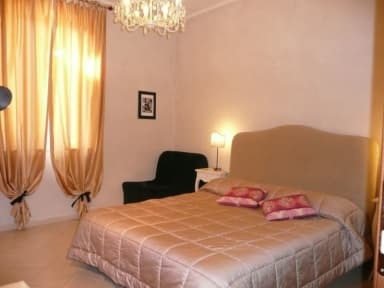 Walter Guest House offers a typical italian breakfast, with milk, coffee or tea, plumcakes,small tart,biscottate slices,bread toasted, jam marmalade, honey, and nuts chocolate cream Nutella. The breakfast is self service available from 7.00 AM to 10.00 AM . 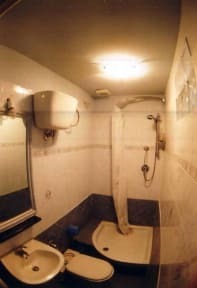 Walter Guest House is 2 blocks off the main Station Termini, 10 minutes from all the main attractions, like the Colloseum, Piazza Venezia, TREVI Fountain, Spanish Steps and the Pantheon. The Vatican City is a little further down the road and you will have no problem as public transport is just under the house. For the night owls, we have a disco just a stones throw away, round the corner the main Basilica of Santa Maria Maggiore and if you want to forget your problems go and have a drink down at the many Irish pubs that are a stones throw away from the house. If you have problems sightseeing, we will try and get you infomation and tips for the day. : We give you the doors room keys so there is no curfew. : free use of lockers cabinet , television set ,hair-dryer, A/C air conditioner. : free cleaning daily of bedroom housekeeping. : free use of the common kitchen furnished ,microwave,stoves,common refrigerator . : supplement 5 euros per person for bedsheets and bath towels,blanckets.Change set every 5 days. : free dispenser of cool water and coffe,cappuccino,tea lemon,chocolate available all day long. : free fresh orange squeezy juice , available all day long . : lugagges storages after the check-out,ask the staff. The check-in time is from 14.00 to 22.00 ,no later please.For forced arrival afterhours ,the hostel reccommende to inform us in advance about late arrival and deal with us if is it possible ,through emails or last day by phone call or whats app that are more immediate and complete ,and please call us our numbers at your late arrival because the ring buzzer may be off. For check-in afterhours there is a small supplement 10 euros per person for the service reception afterhours,only untill 24.00 please..
Payment upon arrival by cash, credit cards. (This property may pre-authorise your card before arrival as warranty congelate money). Please bear in mind that if a property cannot pre authorise your card for any reason, they will email you to ask you for further details. Should they not receive a response from you within 48 Hours they would be then entitled to cancel your reservation due to insufficient card details. Supplement 5 euros per person for bedsheets and bath towels,blankets. Gute Lage, jedoch würde ich nicht nochmal dort übernachten. Start vier haben 5 Personen im Raum übernachtet. Mittags wurde dann im Zimmer die Wäsche aufgegangen und die Betten beiseite geschafft. Mitarbeiter wurden als „DOGS“bezeichnet. The staff was okay, but the location was not at the indicated address, which felt really sketchy. Breakfast was a joke with old cereals and rotten oranges. The Internet didn't work and the shared bathroom was very unpleasant. The bathroom in the room was okay. Overall I would recommend to not stay there!